The fastest Wi-Fi for all your devices. 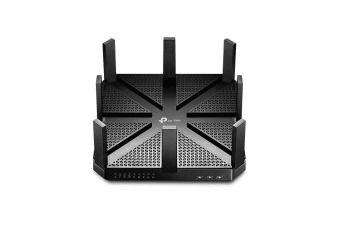 The TP-Link Archer C5400 Wireless Tri-Band MU-MIMO Gigabit Router delivers combined Tri-Band Wi-Fi speeds to 5334Mbps, letting you dedicate an entire band to gaming without slowing down your network. The Archer C5400 gets a performance boosts of up to 25% due to NitroQAM (1024-QAM) and 4-Stream and it also lets you to game at the highest settings without lagging. 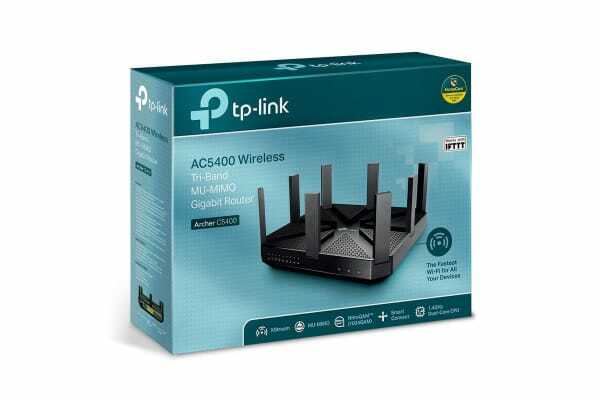 These advanced technologies allow the router’s 2.4GHz band and both of its 5GHz bands to provide industry-leading speeds of up to 1000Mbps and 2167Mbps, respectively. The Archer C5400 does more than just create faster Wi-Fi; it helps your devices achieve optimal performance by making communication more efficient. With MU-MIMO technology, the Archer C5400 can provide four simultaneous data streams, allowing all connected devices to achieve speeds up to 4X faster than standard AC routers. The router serves as a powerful entertainment hub for your home that is capable of supporting multiple simultaneous HD video streams, online gaming and other online activities without slowing down. Superior range and coverage keeps your devices connected, near or far. Eight antennas with Beamforming technology detect the locations of your connected devices and concentrate wireless signal strength toward them. This makes all of your connections more efficient and stable, improving network performance, even in medium-sized offices and public cafes. A Powerful 1.4GHz CPU with three distinct co-processors powers through multiple complex tasks and demanding applications with ease. External hard drives can connect directly to the Archer C5400 via its USB 3.0 and 2.0 ports, making it easy to share large files, photos, music and video across your network. To help your wired devices achieve peak performance for smooth gaming and streaming, the four Gigabit Ethernet ports operate 10x faster than standard Ethernet. Set up the Archer C5400 in minutes thanks to its intuitive web interface and the powerful Tether app. Tether lets you manage network settings, including parental controls and media sharing preferences, from any Android or iOS device. Every device that uses Wi-Fi is protected by HomeCare. Whether you want to block websites, set time limits, see which sites your kids are using or pause the internet, you can with HomeCare. And you can do it all from the Tether app. Choose which devices or activities you want to prioritise with Quality of Service (QoS). In just a few taps, you can make sure your laptop or streaming movie is first in line for Wi-Fi or Ethernet.